I am a cook, not a gardener. I am a sucker for the relatively instant gratification of whipping up a souffle, tossing together a salad, or baking a pie. Even making a loaf of sourdough bread requires a mere 48 hours from wistful thought to butter-slathered slice. Gardening, on the other hand, is an endeavor for those of a patient disposition. It is one thing to hanker after a patch of peas, beans, and berries, but the fulfillment of this desire can take up to a year: you must prepare the ground, plant at the correct moment, and then wait months and hungry months for your harvest, which can in turn be summarily destroyed by pests, weather, or any other contrivance of a cranky mother nature. That is not to suggest I am actively opposed to gardening; this would be impossible for anyone obsessed with food, cooking, and eating. After all, my apple pie is absolutely dependent on those who plant the seeds and tend the fruit. Indeed, I feel a searing pang of jealously on passing even the smallest kitchen garden or community pea-patch. The fundamental problem is that I have rarely stood still long enough to cultivate anything more elaborate than a pot of geraniums. Once, a couple of years ago, I lived in a small studio apartment behind which there were tiny plots of earth available to tenants. Enthused by the thought of peas—tiny orbs bursting with sweetness—I bought seeds and started them on my windowsill. Within weeks green shoots appeared and I planted them in the carefully prepared earth. Then I waited and watered and waited some more. Much to my surprise the plants thrived and I anticipated the harvest, salivating over recipes for succulent salads and ethereal tarts. Then I graduated university and had to move house. I packed my belongings into the car and returned to my garden to say goodbye. The first few peas were just ripe so I picked a plump specimen and popped it into my mouth. It was better than I had imagined. Turning reluctantly away with a puny fistful of peas, I hopped in the car and left. That tender harvest, minuscule though it may have been, gave me an enduring desire to garden again. The problem has been that, like many other twenty-somethings, my life has been nomadic, characterized by constant packing and unpacking. College, move, job, move, grad school, move. I walk by pea-patches and neighbors gardens and sigh; one day, one day I too will have a little garden of raised beds, fruit trees, and chickens in one corner….perhaps even a goat and some bees. Alas, that day has not come yet. And so I have contented myself with a distant appreciation of gardeners and their craft. Much like a gentleman farmer, I stroll about, admiring this labor from afar, my hands unsoiled. Today, my life has become less nomadic and my hankering for a kitchen garden grows stronger daily. Alas, my boyfriend and I live in a small one bedroom apartment and it is not the ideal place for horticultural endeavors. About a week ago, however, I was sitting on the sofa, surveying our little home, and noticing what a large and sunny living room window we have. I sat up, of course! We may not room for poultry (to my disappointment they were not on the list of acceptable pets) or vegetables, but we have plenty of space for herbs. And since it costs upwards of $3 for each miniscule packet of these essential aromatics, we would be saving money too. The next evening I built a bench, one foot by ten feet, running the length of our window. Then I took a trip to the nursery, bought at large bag of potting soil and some seed packets. 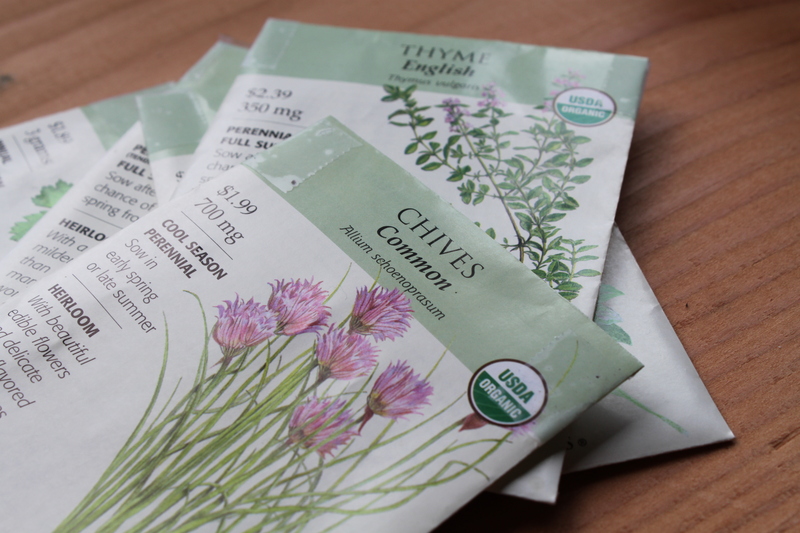 I chose sweet basil and Italian parsley, woodsy thyme, sharp chives, fragrant marjoram, and sultry cilantro. 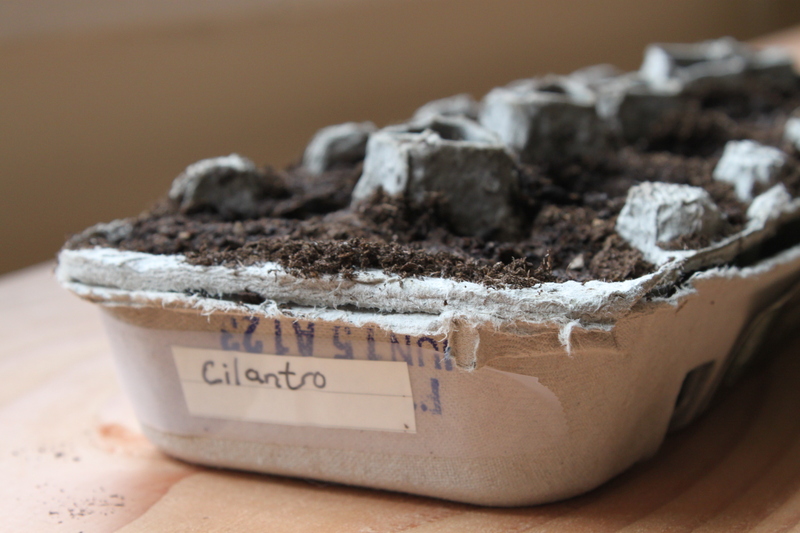 Digging through the recycling, I found a few egg cartons, planted my seeds, and set them proudly on the window bench. And now there is nothing to do but wait, watch the sunshine pour through the glass, and dream of homemade fettuccine flecked with basil, of thyme-scented stews, and fragrant salsa verde. My garden bench is certainly no urban farm, but it’s a start. It is at least something to tend.